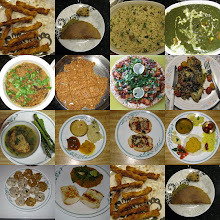 This blog documents my journey in the kitchen from Pav Bhaji to Pesarettu, from Baked Ravioli to Fried Rice and from Cinnamon Sticks to Pizza. A special thanks to my generous mom who let me wander into her kitchen and bug her with questions that she couldn't possible answer with a straight face:). To good food and good life!!! Boil the rice and moong dal with 4 cups of water in pressure cooker until it is soft. Heat the ghee and add the ginger, green chillies, curry leaves, cumin and black pepper and roast until you can smell all the flavours. Add the cooked rice and dal and salt and more water (depending on the consistency of the cooked rice and dal) and mix thoroughly. Allow the mixture to steam and top off with a little more ghee if you like. Enjoy hot with sambhar or gotsu or just as is. Boil the rice and moon dal in the pressure cooker. Heat a pan and boil the cooked rice and moong dal with the milk and some water if required until soft. Add the jaggery and 1 tbsp ghee and allow it to melt. Fry the cashews and raisins in ghee and add to the mixture above. 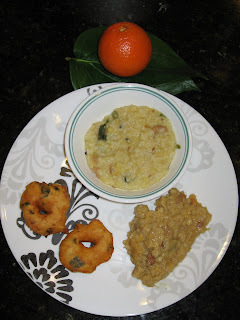 Chakkari pongal is ready to be devoured with the vada. Soak the urad dal with water for 2 hours and then grind it with very little water and salt to taste. Add the green chillies, red chillies, ginger, curry leaves, coconut slivers, black pepper to the urad dal batter and mix well. Wet your palms and place a tbsp of batter on the palm. Use wet hands to pat it flat and make a hole in the center. Heat oil and drop the vada and deep fry until golden brown. Enjoy hot!!! Thank you so much :). I am excited about being part of the event!! !